It’s now upon us, the week when loved ones gather to offer thanks, and food often takes center stage. In America we have this tendency to overdo things… witness: the food at state fairs. Hot Beef Sundae. Fried Beer. Mealworm-covered Caramel Apples. Fried Butter. (Yes, that was actually served at the Montana State Fair). You’ve probably heard of Turducken – a chicken, encased inside a duck, encased within a turkey. Then the whole thing is cooked up as the ultimate poultry feast. Actually, the official name is the Pumpecanapple Piecake, and it comes from Three Brothers Bakery in Houston. It weighs a whopping 23 pounds and fetches $175. It also takes a machete to slice it. (So if your holiday family dynamics get a little out of whack by dessert time, just come out wielding the cutting utensil and you can pretty much call the shots). It’s actually three pies within three cakes, all stacked on top of each other. 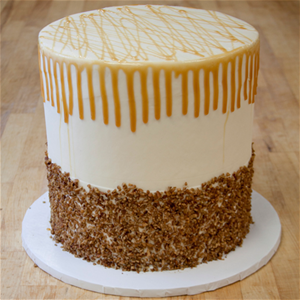 An apple pie within an apple spice cake. Lord willin,’ you’ve already booked yourself and your loved ones into a Charleston beach house for the duration, be it a luxury house on Isle of Palms or a Folly Beach house Charleston. While much of the country is grappling with mounting drifts of the white stuff, the Lowcountry is going to be blissfully free of it. SC vacation rentals are a great bet any time of the year, but they are especially enticing when you leave home wrapped in winter woolens, only to emerge from the plane peeling off the layers. Our collection of beach house rentals Charleston SC offer a great selection depending on your needs and budget. Isle of Palms luxury rentals are available in different occupancy levels and proximities to the beach, and most have gourmet kitchens ready for you to prep your holiday meals. Folly Beach rentals Charleston are available for a different island setting near Charleston. As I wrote in a recent blog, Middleton Plantation is offering a Thanksgiving buffet on Thursday. Combine all ingredients in a sauce pan and bring and heat until dissolved. Brush on your turkey towards the end of cooking to form a nice golden brown skin doing so in 10 minute intervals. Mix flour and salt in bowl of mixer. Slowly add butter to flour while mixer is on slow/medium speed. Mix until butter cubes are about pea sized. Slowly add water a little at a time until a dough ball forms. You may not use all the water. You are looking for a drier dough. Divide dough in half and wrap each half. Allow dough to chill and rest at least 20 minutes. Roll out each dough half to a circular shape. Line pie pan with one of the halves and allow dough to hang over the pans edge about an inch. Trim if needed. Save the other rolled out half for the top. Place dough in the refrigerator while you are preparing the filling to allow dough to firm up. Mix together sugars and spice in a separate bowl. Peel and cut apples. Sprinkle sugar mixture over apples and allow them to macerate. Once some sugar has resolved and the mixture has made some juice, add flour and mix. Place apple mixture in prepared pie pan and add butter pieces on around on top. Brush the edges of the crust with an egg wash. Place top pie crust on and pinch sides together. Finish the edges of the crust as you would like. Cut small vent holes on the top to allow steam to escape while baking. Egg wash the top and sprinkle with sugar in the raw (optional) and bake pie at 425 F for 20 minutes and then turn heat down to 375 F and allow to finish baking. Pie crust should be a golden brown and filling should be bubbling through vent holes. Allow pie to cool before serving. It’s a perfect time of the year to be in rental homes South Carolina. Exclusive Properties offers the best in luxury beach house rentals SC, especially Isle of Palms vacation rentals. So give us a call when you are in the market for one… and remember to count your blessings, count them one by one.